Not done shopping? There’s still plenty of time! Some people are hard to shop for and right about now, you may be looking at all the people left on your list and wondering what to get the ones who have everything? 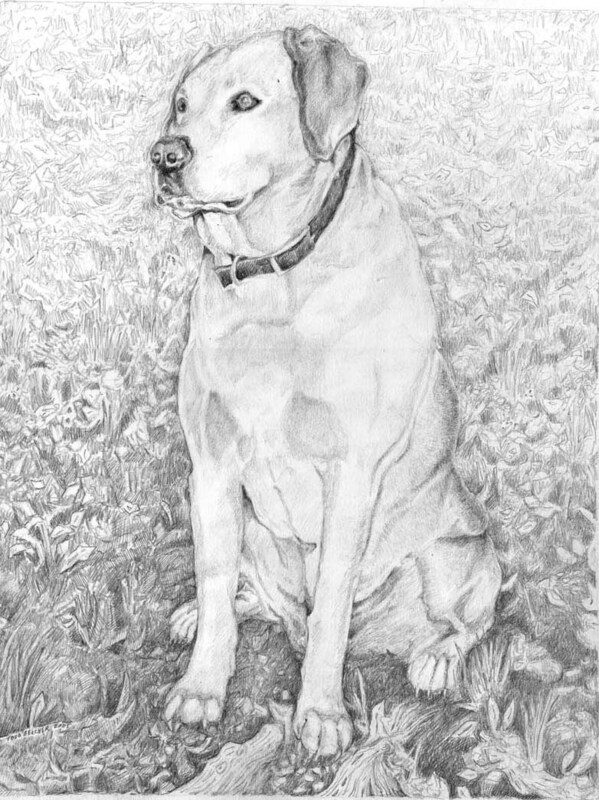 Everyone loves their pet and the gift of custom art. A Jimmydog gift certificate is so easy. 10 minutes on the phone and you’ve given that person who has everything, the one thing they don’t have and a gift they will cherish their entire life. Call us now 336-201-7475. Happy birthday to me! Is it OK to wish yourself a happy birthday? I think so. I’ve got a lot to celebrate: I’m 15! Fifteen! Can you believe it? I know. I don’t look a day over 10 and most days I still feel like a pup, always ready for an adventure—and by adventure, I mean a ride in the car. On my birthday, Stephanie and Todd Belcher, the best people ever, always shower me with extra attention and a few extra treats, but I don’t expect any big gifts. I have everything I need—an attractive collar that complements my eyes, regular spa days, comfy dog beds and nice people sofas to sleep on. What more could a dog want? But I do have one birthday wish: I would like all animals (even cats) to have the same wonderful life as me. 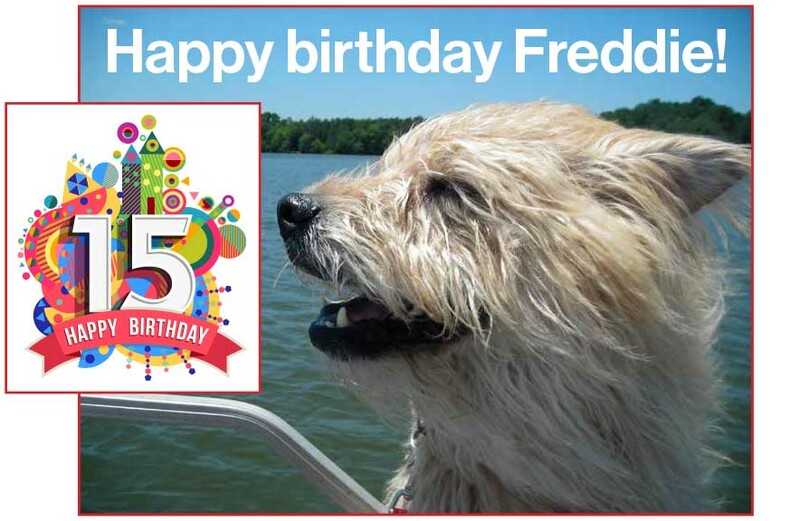 Being a rescue dog myself, if you’d like to celebrate my birthday along with me, please make a small donation to an organization that helps animals. There are so many good groups, but here are a few that we know well. Unchain Winston This organization works to make sure no dog lives its life at the end of a chain. It’s a compassionate, nonjudgmental group that believes in responsible dog ownership. To help end the practice of dog tethering, UNchain Winston builds fences and dog runs for qualified families in the Winston-Salem, North Carolina, area; builds and distributes dog houses; repairs existing fences; offers free or low-cost spay/neuter, vaccinations and vet care; educates pet owners; and, when able, provides other resources, like pet food, leashes and collars. Whew! That’s a lot! Full disclosure: I’m partial to UNchain Winston this organization because Stephanie is a co-founder and devotes countless hours to it. Often, she’ll go out on a Sunday morning, help build a fence for a dog, celebrate the big “unchaining” with the pup and be back home before I’m fully awake and dressed for my day. She’s a busy, animal-loving woman! Check out Unchain Winston on Facebook to learn more. Stepping Stones Canine Rescue With years of animal rescue and fostering experience between them, a group of friends recognized the need for a canine only rescue group in the Triad area. Consolidating their shared goal to help dogs of all breeds find the best possible home, while also matching adopters with their ideal companion, they joined forces to create a new rescue group. 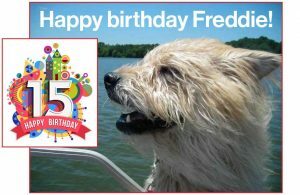 A charitable and educational non-profit corporation with an enthusiasm for dogs and a mission to rescue, protect, provide sanctuary and ultimately find adoptive families for abandoned, stray and neglected dogs. Follow Stepping Stones Canine Rescue on Facebook to learn more and meet all the beautiful dogs they rescue and find wonderful homes like I have! AARF The Animal Adoption & Rescue Foundation of Winston-Salem helps homeless and helpless cats and dogs in the Winston-Salem area by providing rescue, foster care and adoption to forever homes. We have lots of friends who’ve gotten their dogs and cats through AARF. It’s a great group that can always use additional funds. Learn more at AARFAnimals.org. Forgotten Felines of Forsyth works to humanely reduce the feral and stray cat population in Forsyth and surrounding counties in North Carolina through a Trap-Neuter-Return (TNR) program. At its monthly spay-neuter clinic and through partnerships with local vets, FFF sterilizes and vaccinates 300 to 500 cats a year. Check it out at ForgottenFelinesofForsyth.org. Forsyth Humane Society FHS is a no-kill adoption center for dogs and cats that finds forever homes for more than 700 animals a year. It also distributes vouchers to reduce the cost of spay/neuter and distributes 4,000 pounds of pet food a month to people who need help feeding their pets. Kids camps and other community programs help educate people about responsible pet care and ownership. Donate at ForsythHumane.org. Hidden K Stables Rescue and Rehabilitation Hidden K rescues horses in need of health care, nutrition and rehabilitation—and then rehomes them so they live their best horsey lives. It also educates people, especially kids, about the responsibilities of caring for a horse. Learn more at HiddenKHorseRescue.org. Piedmont Farm Animal Refuge Did you know there are places that rescue neglected, abused and abandoned farm animals and educate people about the cruelties of factory farming? This refuge, near Pittsboro, North Carolina, is home to more than 100 sheep, goats, ducks, chickens and turkeys. We have a friend who volunteers there—and who’s learned that chickens purr, turkeys like to snuggle and sheep can recognize as many as 50 different people faces. Who knew? If you can’t donate money (I, myself, never have any cash and don’t have the paw dexterity for the ATM), consider spending a few hours volunteering at one of these groups or similar organizations in your area. They always need help with everything from socializing and grooming animals to the less glamorous but necessary tasks of litter-box scooping and laundry. Tell ’em Freddie sent you! As for me, I’ve got a bit more celebrating to do! Everyone has a hard-to-buy-for person on their holiday list. But even the person “who has everything” will appreciate a custom portrait — and will be touched by your thoughtfulness. It’s not too late to give the gift of custom art. Contact us today and see how easy it is. When Julie, a super fan of Esther the Wonder Pig wanted a painting of her with best pal Shelby the dog, she turned to Todd, knowing he would create a work of art worthy of a celebrity pig with more than 1 million social media fans, a best-selling book and an amazing sanctuary for all animals Happily Ever Esther Farm Sanctuary. Todd was nonplussed by the assignment—whether painting a world-renowned pig or your dog or cat, all his subjects get the same loving attention and care. Watch Julie explain how Esther’s dads, Steve and Derek, ended up with their own copy of the painting. Todd always has had an interest in drawing animals and in graduate school began to focus his work on them, painting a series of works featuring penguins, pigs, cows and elephants. Today, his primary subjects are dogs and cats, but he loves the opportunity to paint everything from horses to flamingos to “wonder” pigs. 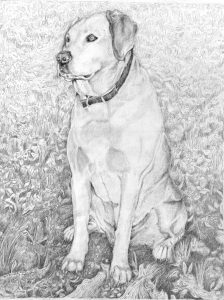 Contact us today to see how easy it is to commission a portrait of your best animal friend. Give your loved ones a Jimmydog gift certificate for the holiday. It’s personal! It’s unique! You can be sure they don’t have it! It’s easy! Give us a call at 336-201-7475 and in a few minutes your shopping is done, and you’ve given your loved ones a gift they will cherish forever.